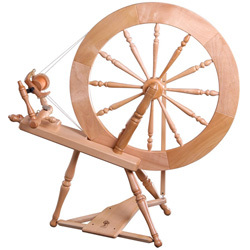 No, not yet another cast-on, but a spinning wheel. Or rather a box of bits. Hurray. Short of hardware. Hmm. Screws etc aren't going to be a problem, but missing crank might be. 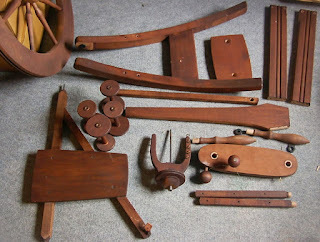 Have made enquiries about the 'clunking wheel kit' which I think might do the trick. It was hardly used before it was dismantled and stored, it should look as good as new when polished and assembled! Is that a traddy? Looks really nice, I love the dark colour of it! Yes, it is! (Ashford 'Kit-Kraft' it says on the box. Interesting that although they still supply them in the same self-assembly form, they don't play on that any more). It's amazing that their designs have changed so little over the decades. Great news when you need spare parts for the old ones. It looks home-stained. I've never done it, but I agree, it's certainly a nice effect. It'll look fab with a shine on top.